Experience about programming and architecture. Musings about delivering and quality. Findings about projects and people. I haven’t the full reason for the problem – exactly which implicit line ending that goes wrong – or whatever else that is broken. But the (almost) fix is – don’t use the minified version. At github you can get either version as (respond.min.js or respond.src.js). Go for the latter, it is the non-minified one. In my unlatched IE7 I get a somewhat stocastic behaviour. When just browsing it first fails but a reload makes the page load properly. Other browsers – including Safari/Ipad and built-in/Android seems to work alright with the minified version. I found an article about how to add items to your Sendto folder in Windows 7. Easy as pie. It worked on my machine and as long as I didn’t need to handle Allusers or anything fancy like that it did what it should – allowed me to enter a shortcut into the Sendto folder. When running 64 bit Windows 7 and trying to download from MSDN you might get… nothing. 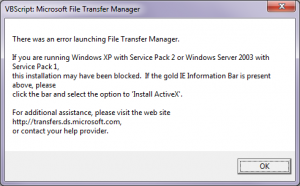 The problem is that the File transfer manager is 32 bit and your IE is 64. Solution is to start IE in 32 bit. Either find it in the start menu. Or look in C:\Program Files (x86)\Internet Explorer. There was an error launching File Transfer Manager. click the bar and select the option to ‘Install ActiveX’. or contact your help provider. Note: I got the text out of the dialogue through ctrl-c. Try to attach a database with Management Studio when using Windows 7 and SQLServer 2008 developer edition and one might get an error message similar to the title of the article. Whether this is a bug or not is beyond my knowledge but the solution/workaround is to connect as SA and not as windows authentication. CompulsoryCat is a small dotnet helper lib for getting meta data in a safe way. http://ideas.selfelected.com/ is a site for ideas, ideas and ideas. It isn’t impossible, it only takes a bit more time. keyboard1337 – a keyboard layout for (Swedish) programmers The US layout is better for most programming languages – but the French layout has some advantages. Spiced up with Swedish characters. © 2019 Selfelected. Stunning Silence WordPress theme by Brandon Wang.